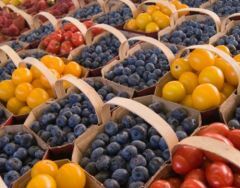 If you're not a fan of farmers' markets, you're really missing out on some fantastic produce and should give them a try. Buying directly from the farmer not only assures you of the freshest vegetables and fruits, but the prices are often cheaper than what you'd pay at a grocery store. But getting to the farmers' market can be a hassle, unless you live or work near one. As someone who's lazy and doesn't always have the time to go to my local farmers' market, I looked into having produce delivered to my home. That was a bit costly. The people behind GOOD, a collaboration of individuals, businesses and nonprofits with a goal of "pushing the world forward," found a solution. Or at least its contest seeking design solutions to getting food grown by local farmers into urban hands found a solution. It's sort of like an ice cream truck, but instead of peddling high-fat ice cream, the winner of the contest came up with a "Farm on Wheels" to bring fresh produce to urban Los Angeles. The mobile vending concept is a fleet of electric trucks dispatched from three permanent markets to neighborhoods. Instead of ice cream trucks chugging through neighborhoods, an electric truck would sell carrots and apples. It's a unique idea that should make money, although who knows if the entrepreneurs on Shark Tank on ABC would want a cut. According to the winning entry on the GOOD blog, the Farms on Wheels program "selects fresh fruits and vegetables from local farmers and distributes the produce through a network of farm trucks. To engage more people in the consumption of fresh foods and support local and urban agriculture, Farm on Wheels creates a simplified and convenient food distribution network between farmers and consumers." It was created by Mia Lehrer + Associates, a design firm in Los Angeles. The GOOD contest had 22 finalists for redesigning farmers' markets, and many expanded them to just about every common area where people gather, including a gas station. There are some great ideas there, which, if they become reality, could save produce buyers some cash.